Meesapulimala is the second highest mountain peak in south India. It is situated near Munnar town in Idukki district, Kerala state. It can be reached ONLY BY TREKKING. The mountain peak is at a height of 2,640 meters or 8,661 feet above sea level. Meesapulimala. Image courtesy – Laser Shine. Kerala Forest Development Corporation Ltd (KFDC), a Government of Kerala undertaking, has Package tour to Meesapilimala, as part of promoting Kerala Tourism. It can be booked online (Munnar package). The Meesapulimala trekking is an Eco-friendly tourism package. Contact numbers are 04865 230332, 8289821400, 8289821401, 8289821408. It is illegal to trek to Meesapulimala by any other routes than using any of the three package tours from KDFC, given below. Those caught doing illegal trekking (mostly with illegal passes from Kolukumala) may be imprisoned for a term extending from one year to five years and (or) fine ranging from rupees 1000 to 5000, plus penalty charges for any damage done to the environment. The problem with illegal trekkers is that they leave a lot of plastic materials in the area, which is home to Nilgiri tahr (Varayadu) and many other animals. Post-mortem reports of some of the dead animals in the area has proved this. 4.5 kilograms of plastic was found in one of the dead Varayadu‘s stomach. 1 How Do I Go to Meesapulimala? 1.1 Which are the Nearest Railway Stations and Airports to Meesapulimala? How Do I Go to Meesapulimala? The package tour of Meesapuli mala starts from the Forest department’s office on the Munnar – Mattupetty road. It is situated near to the Munnar Post office junction and close to Silent Valley Estate and Rose Garden.You need to get the trekking permit from the Forest department office. There are three trekking package tour options available. Third option is exclusive to honeymooners. The first option is to avail the service of the forest department jeep and go to the Base Camp at around 6000 feet above sea level. You have to pay separately for the jeep in this package. You will be taken to any one of the 20 tents here. A total of 40 people can stay in 20 tents. The cost of stay at each tent is INR 4000 for two persons. (Rates may change. Please confirm the rates with KFDC.) This option is the most economical package available. Electric fencing is there to avoid wild animals from entering the tent area. Electricity is generated for camp site is generated using a micro turbine, situated near the tents. Water from the top of a hill is supplied to this turbine using pipe. Food and service of a guide are part of the forest department’s tour package. From the base camp, trekking to Meesa pulimala is arranged in the next day morning. It is around 11 kilometers one-way. i.e. You need to trek around 22 kilometers to go to Meesapulimala and come back to the tent. This trekking route passes through Rhodo Mansion, mentioned below. Second option is to hire a Jeep (or take your four wheel drive vehicle) to “Rhodo Mansion”, another camp site of the state forest department. It’s after the base camp. Rhodo Mansion is at a distance of around 28 kilometers from the Forest department’s office at Munnar hill station. There are two cottages in the Rhodo Mansion. Rhodo mansion charges Rupees 7000 for a cottage, which can accommodate two persons. One extra person is allowed in a room, by paying rupees 1000 extra. The second cottage can accommodate 3 persons. Charges are rupees 9000 for three persons per night. “Rhodo Mansion”is surrounded by Rhododendron Flowers. It is located a few kilometers after the earlier mentioned base camp. You can enjoy the tasty food, participate in the campfire and stay overnight here at the cottage in Rhodo Mansion, at around 7500 feet height above sea level. 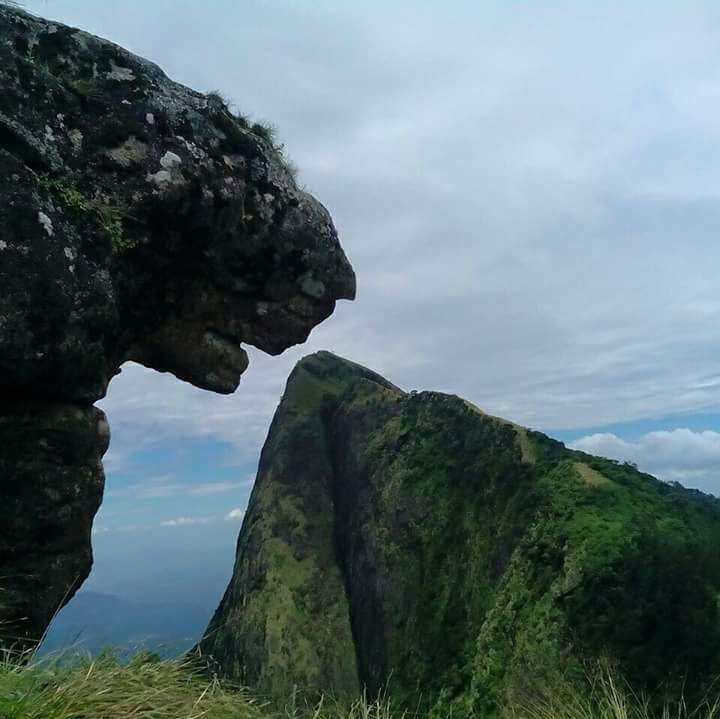 Actual trekking to the Meesa pulimala mountain peak from Rhodo Mansion accompanied by a guide, starts in the morning and it takes around two plus hours of rigorous trekking; crossing streams, misty mountains, valleys, etc, to reach Meesapulimala. Trekking distance is around 5 kilometers, one-way. Sky cottage is a lonely cottage on a cliff facing a beautiful waterfall. This cottage has large glass windows and transparent ceiling. You feel at your romantic best with the splendid view of the misty hills and lofty mountains! Next morning, you can trek to Meesapulimala, accompanied by an expert local guide. Charges per couple is Rs 7000 or 9000 (not sure). Two extra persons are allowed in the cottage, by paying rupees 1000 extra per person. Please confirm the charges before booking the cottage, as it is subject to change. Note : Jeeps normally takes you to the camp site and drops you back at the forest office, on the next day. Please confirm this and the rates at the time of booking. Which are the Nearest Railway Stations and Airports to Meesapulimala? The nearest railway stations to Meesapuli mala are Alwaye (Aluva) and Angamali, both around 120 kilometers distance. Ernakulam South alias Ernakaulam Junction (ERS) and Ernakulam North alias Ernakulam Town (ERN) are the two Major railway stations to Meesapuli mala, at around 130 kilometers distance. Madurai Junction railway station is another major railway station, at around 136 kilometers distance. Cochin International Airport is the nearest airport at around 110 kilometers from Meesapulimala. Madurai Airport is at around 140 kilometers distance from Meesapuli mala. Some of the scenes in the song “Titli’ in the super-hit Hindi movie “Chennai express’, starring Shah rukh Khan and Deepika Padukone were shot here. “Roja Kadale” song in the Tamil movie “Anegan” (Super star Dhanush and Amyra Dastur in lead roles) was also shot at Meesapulimala. Are you interested in trekking to Meesapulimala, the heaven on earth? Please leave your comments below.